Students have the opportunity to participate in band, choir, and theater arts at Cheldelin. 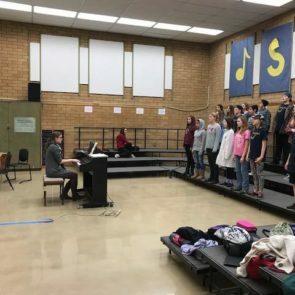 A magnet orchestra program is offered at Linus Pauling Middle School for middle school students from Cheldelin, Linus Pauling, and Franklin. Join us! Band is an elective option for students in grades 6,7, and 8. This is a year-long ensemble. Advanced band participants will be encouraged to participate in a solo or small ensemble setting such as a Solo and Ensemble Festival. Grading for all levels is based on participation, citizenship, practice, tests, and performances. Middle school Theater Arts classes are specifically designed to teach students about how the theater arts can support, reinforce, and enrich your life. Building confidence in public speaking, creativity, and ensemble work are skills that will help you become aware of yourself and how you are perceived by others. This is a .5 credit (one half year) class option.